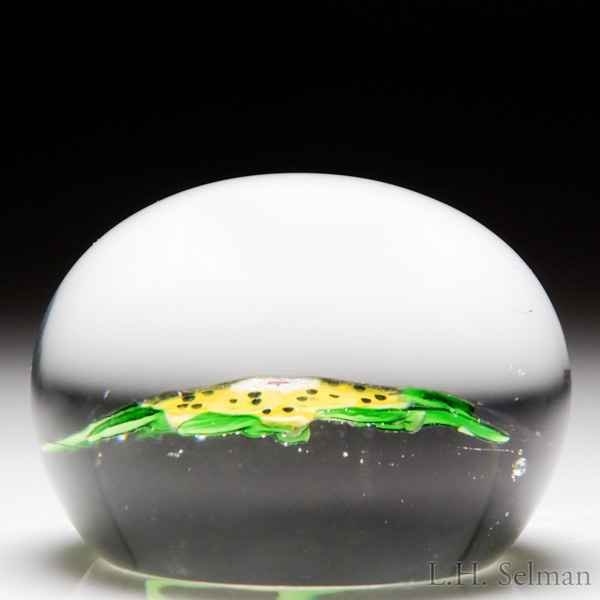 Antique Baccarat yellow wheatflower paperweight. Two tiers of round, black-dotted petals have a white complex star cane with a red bull's-eye at their nexus and are crowned by five apple green leaves. The wheatflower sits atop a short, leaning stem flanked by two additional leaves, over clear, star-cut ground. From the George Kulles Collection. Very minor chipping to star cut. Diameter 2 7/16".